Frank R. Kearney testifies on the workers compensation system at D.C. City Council committee hearing. That was the basic message Mr. Kearney delivered on the D.C. workers compensation system when he was invited to testify as a witness at a City Council Public Oversight Round table on Friday September 26th. The round table was held to discuss certain issues pertaining to the review of D.C.'s Workers' Compensation program, including the delay that is rampand throughout the D.C. workers compensation system. The more cases and decisions are delayed, the more it hurts the injured worker. Frank spoke on the issue of delay - calling it a widespread problem that needs to be fixed. He cited two main issues with delay - the length of time it takes to reach a decision and the length of time it takes to get a formal hearing. These delays hurt injured workers tremendously. In D.C., a legitimately injured worker must often go for long periods of time without pay or any benefits while waiting (sometimes more than a year) for a decision. Most of these workers have families to provide for. And the workers' losses are compounded, often forcing them to take on substantial debt. Mr. Kearney stated that if the existing rules and laws were enforced, then other issues and problems cited by other committee witnesses would be discovered and resolved more efficiently. But the issues do not stop at delay. Many of other witnesses that were present talked about the shortage of qualified Administrative Law Judges; expressed ideas on making the Workers' Compensation Program an independent agency; and described the loss of faith many injured workers are now facing because of the rulings of the disbarred ALJ Verma. The video for this round table will be available soon and uploaded to our site. For a copy of Mr. Kearney's written testimony on workers compensation issues, follow the link. 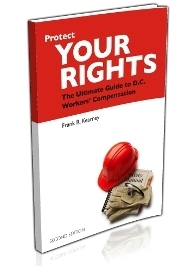 To order a copy of his book on workers compensation, click here. Or call 202-393-3320 and we'll send you a copy of the book.